Burton, P. and Phipps, S. 2010. Families, time and well-being in Canada, Luxembourg Income Study Working Paper Series, No. 537, pgs. 27–29, accessed at http://www.lisproject.org/publications/liswps/537.pdf on January 15, 2012. In 1971, mothers and fathers living in couple relationships and having children under 18 years of age living with them worked on average 48.6 hours per week for pay. By 2006, that number had increased by 37% to 66.6 hours; however, the increase was attributable to mothers working more hours for pay. 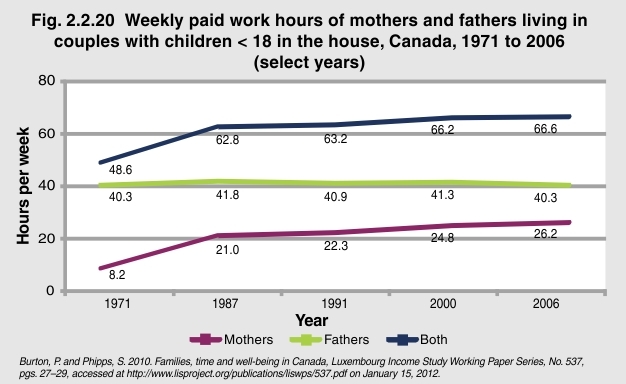 The time mothers spent in paid work increased over threefold to 26.2 hours per week in 2006 from 8.2 hours in 1971. Furthermore, the increase in mothers’ paid hours has been proportionally greater for lower-income families. While the largest increases in hours have occurred for low and middle-income families, the largest increases in real income have occurred for higher-income families.